The distillery began selling spirits in early 2018 starting off with a line of flavored whiskeys. 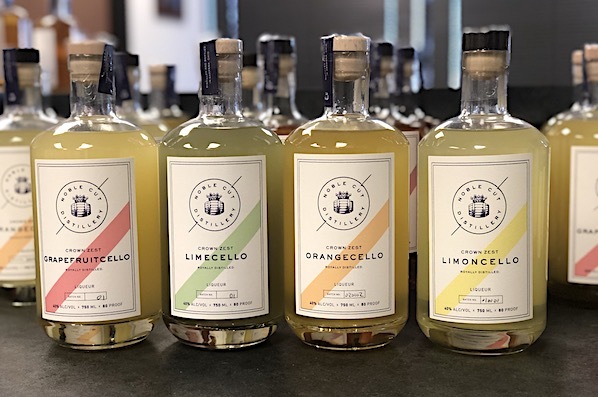 They debuted their limoncello, an Italian lemon liqueur, in June of 2018, the recipe for which has been passed down six generations through Noble Cut distiller and co-owner Tony Guilfoy’s family. The story of Sarafina and some of the additional rich history behind Guilfoy’s family, who hail from Naples, is featured on the labels of the limoncello and Noble Cut’s other flavored cello liqueurs. Last month Noble Cut launched the grapefruit cello, which uses over 600 pounds of hand-zested ruby red grapefruit, and a limecello that is made with 400 pounds of Persian limes. While the other locally-made limoncello from Tessora Limone, which is based in New Albany, is only around 20% alcohol, Noble Cut’s cellos each clock in at a much higher 40% ABV. Speaking of cocktails, Guilfoy suggests combining two parts Grapefruitcello, one part Vim and Petal gin from Middle West Spirits, and seltzer water for a refreshing spring/summer cocktail. Noble Cut Distillery is located at 750 Cross Pointe Rd, Suite K in Gahanna and hosts bottle shop hours on Saturdays from noon to 4pm. Distillery tours can be booked online. Noble Cut spirits are also available in select state liquor stores, a list of which can be found on the distillery’s website.